This feature allows you to edit and update the information within your profile. 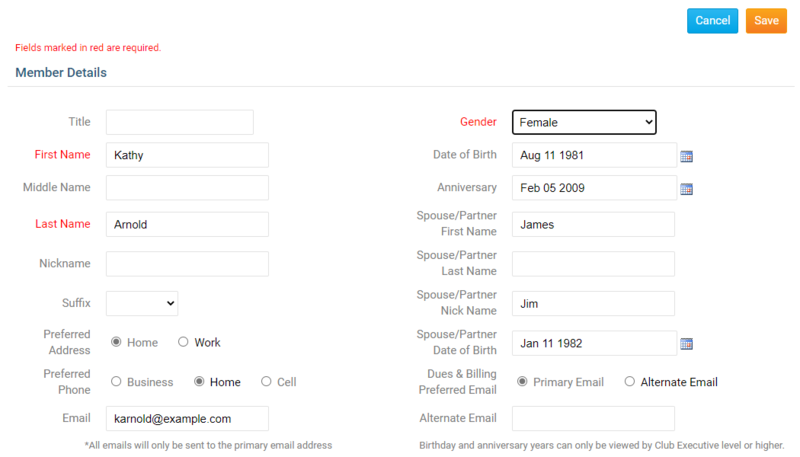 You can change your email address, phone number, password, login name, and more. Your profile contains details such as your address and contact information, as well as personal information you choose to share with your fellow club members. 1. To access your profile for editing, you must go to your club homepage and login. 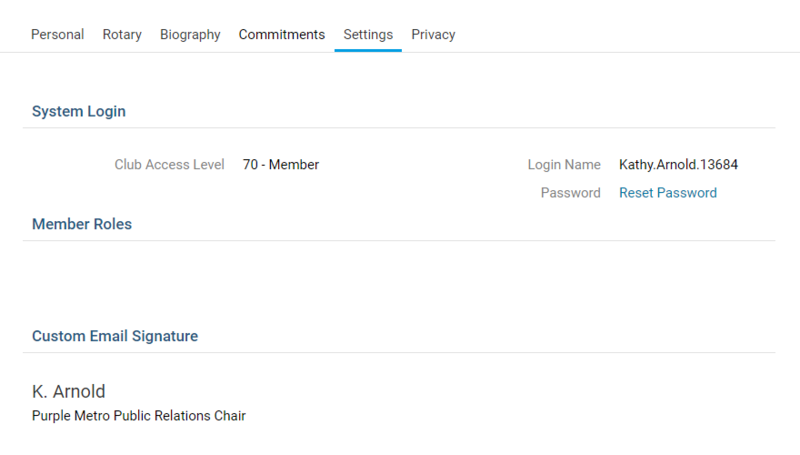 Then, click on Member Area on the top right. 2. Along the top of the screen, you will see several blue tabs. Click on the My ClubRunner tab. 3. Next, click on the My Profile link on the grey menu bar below My ClubRunner. 4. You are now on the Member Profile screen. This screen contains your personal information, which may be shared with fellow members of your club. To add or update the information that appears click on the Edit button just above your personal information. 5. You can now enter your personal data into the fields listed or edit existing information. Note: Fields marked in red are mandatory. If you try to click Save when a mandatory field is blank, you will receive an error message. 6. When you are finished editing your profile, click Save. There are Save buttons at the top and bottom of the Member Profile screen. Click Cancel if you do not wish to save your changes. There are 6 tabs on the member profile. Each one contains different information. 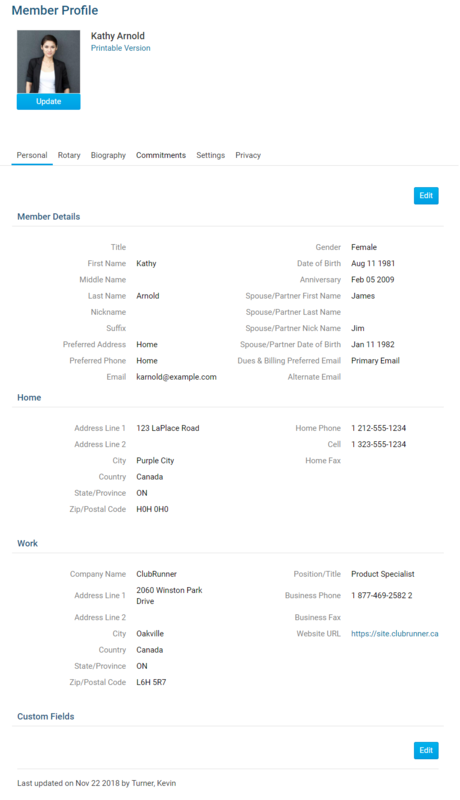 On this page it displays personal information about the member. This is useful to see if the profile is up to date. If you want to edit any of this information click on the Edit button and once done click Save. Profile Picture: This displays a picture of you. To learn how to add/update your picture, please click read the article titled How do I Change my Profile Photo?. Member Details: This area displays the member's Title (Eg. Mr, Mrs, Dr, Rev), First Name, Middle Name, Last Name, Nickname (Eg. Dave, Mike, Bill), Suffix (Eg, Jr, Sr), Preferred Address, Preferred Phone, E-mail, Alternate E-mail, Gender, Date of Birth, Anniversary, Spouse/Partner First Name, Last Name, Nick Name, and Date of Birth. Home: This area displays the member's Home address and Phone numbers. Work: This area displays the member's Work Address, Position/Title, Phone number, Fax, and Website URL. Custom Fields: This displays the fields that were created by the Club. These fields are used to gather additional information about the member. The data could be a date, flag, or field/text. For more information read the Custom Fields article. On this page it displays information about the Rotary and attendance. Membership Details: This area shows the Club name, Rotary Member Number, Membership, Office, Sponsor, Membership Type, Classification, Date Joined Club, and Date Joined Rotary/Admission. Member Designations: This displays the member's designations. For more information read the Member Designations article. Club Attendance: Shows their current year to date attendance percentage, last year's year to date attendance percentage, and year to date attendance report. This page displays the biography of the member. If you want to edit any of this information click on the Edit button and once done click Save. Public: This area can be view by anyone in the Club and District. 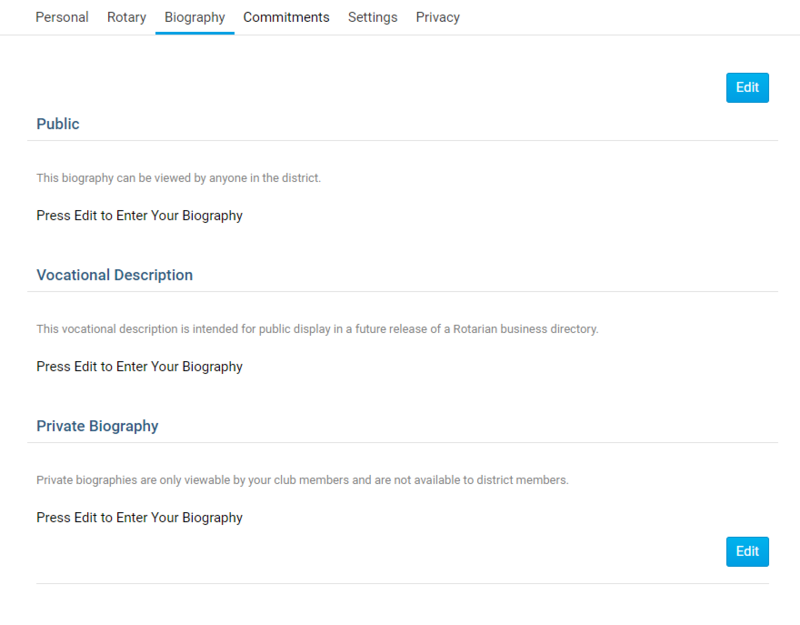 Vocational Description: This is for anyone to see in the future release of a Rotarian business directory. Private Biography: This can only be viewed by your Club members, it cannot be view by the District or the public. 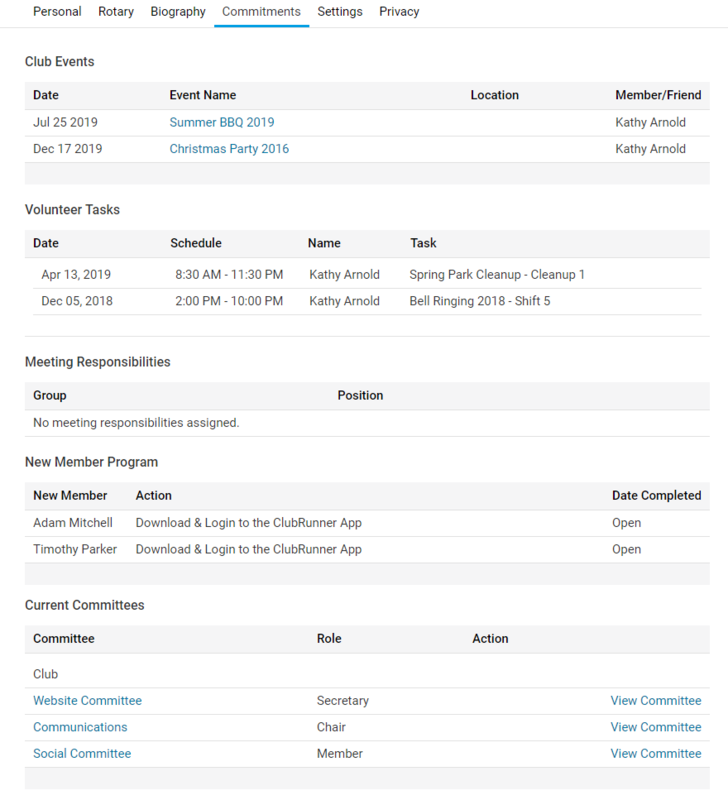 This page displays the Club Events, Volunteer Tasks, Meeting Responsibilities, New Member Program, and Current Committees you are in. Club Events: This displays the events you registered for. For more information read the EventPlanner and MyEventRunner articles. Volunteer Tasks: This displays the volunteer list the member signed up for. For more information read the Volunteer article. Note: This will display "Loading Volunteer Data..." for a few seconds as it loads. Meeting Responsibilities: This displays the meeting responsibilities you have. For more information read the Meeting Responsibilities article. New Member Program: This displays the activity you have in the New Member Program. For more information read the New Member Program article. Current Committees: This displays the committees the member is in. For more information read the Committees article. On this page it displays the Access Level, Login Information, Member Roles, and Custom Email Signature. If you want to edit any of this information, click on the Edit button, and once done click Save. Club Access Level: This is the level of access the member has to the Club. For more information read the Access Levels article. Login Name: This is your login name, and you can modify it as you see fit. It must be unique value across all of ClubRunner. Password: This allows you to update your own password. Note that you do need to know your current password. If you no longer know your password, this article should help: I cannot login to ClubRunner. Member Roles: This displays if the member has read only access to MyEventRunner. Custom Email Signature: This displays the member's email signature. 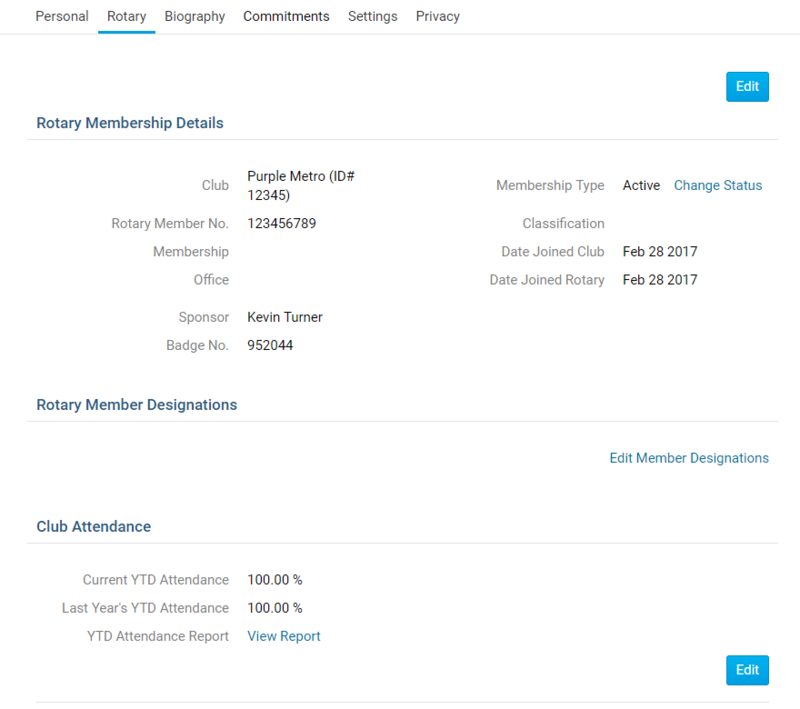 This page shows the member's Communication Preferences, Search Privacy and Club's RI Integration Privacy (If you are a Rotary Club). If you want to edit any of this information click on the Edit button and once done click Save. Communication Preferences: The member can choose not to receive certain emails. For more information, read the Email Privacy article. Search Privacy: These options allow you to control what information is available to members who are not in your club when they use features such as the District’s Member Search and view your Club in the ClubRunner Mobile app. Note: The ClubRunner mobile app stores cached data for offline use and when internet connectivity is limited. This means, changes made to your privacy settings may take time to update and display in the mobile app. The mobile application caches member data for 14 days. Note: Any individuals who are listed in their Club's Executives & Directors list will have their Name and Position listed in the Mobile app. All other privacy options will be respected. 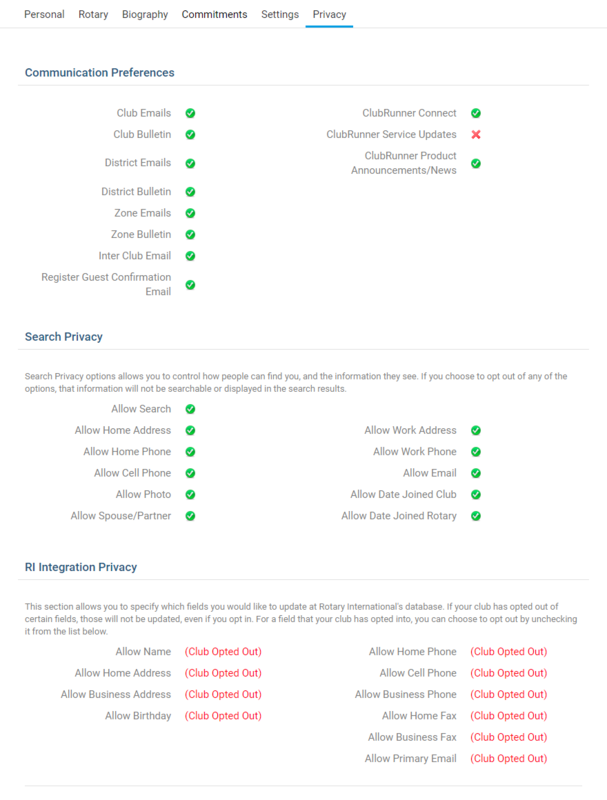 RI Integration Privacy: Only Rotary Clubs have this option. This displays the Rotary International Integrations settings for the members. For more information, read the RI Integration Guide.